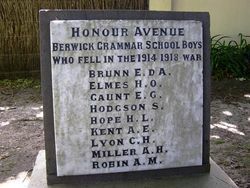 An avenue of honour commemorates Berwick Grammar School scholars who died in service or were killed in action in World War One. Nine English and Pin Oaks were planted in memory of the fallen. Outside a private residence in Church Street, a memorial tablet lists the names of the scholars. 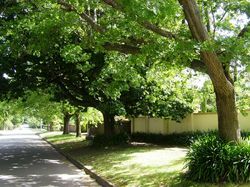 Note : The Berwick Grammar School was established in 1882 in a house at 76 Brisbane Street (on the corner of Church Street) where it ran until 1928. On Monday, June 7, a fine muster of old boys of the Berwick Grammar School assembled at the school to unveil an honor roll to the memory of their former schoolmates who volunteered for active service abroad. The roll contains 66 names. 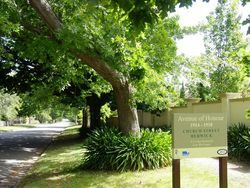 A row of trees was also planted to the memory of the boys of the school who died in action. Mr E. R. Davison was elected president for the ensuing year. Weekly Times (Melbourne, Vic), 19 June 1920.
Who Fell In The 1914 1918 war.